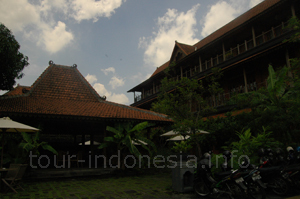 Located nearby Solo city attraction like Mangkunegaran Palace, Galabo food street, solo city walk, and Ngarsopuro traditional market, keraton Kasunanan Surakarta Hadiningrat, this luxurious boutique hotel owned by the former mayor of Solo (Joko Widodo / Jokowi) all have the same view, to Mangkunegaran Palace. This make all guests feel like actually being in the palace. With a rate of Rp 865,000 per room, facilities include a bathroom with a shower of cold water and hot water, IDD telephone, TV, mini bar, guest amenities, breakfast, and service delivery to and from the hotel or airport. For those of you who are planning a vacation to Solo and looking for accommodation near the Mangkunegaran Palace, Hotel Omah Sinten could be an option. "Omah" means house, while "Sinten" means who's?. So this brand name is just like "who's house?". We, the citizen who live in Solo recognize the owner of this place is belong to our beloved former Mayor, Jokowi. With the concept of boutique hotels, Omah Sinten offers lodging with highest atmosphere of classical Javanese and environmentally friendly. Fully equipped with ethnique wooden material, Omah Sinten has a restaurant in addition to a part of the restaurant facilities can also be enjoyed to the public. Menu available include course special menu nationwide as garang asem, ribs with rice, ndeso vegetable (sayur ndeso), tongue with tomato soup, and fried chicken with lemongrass. Omah Sinten also the only hotel that has a mini cinema in Solo. Integrating Java architecture and sophisticated technology, despite the mini size, but the sound and picture quality is not inferior to a regular movie theater. The Omah Sinten conveniently provides free parking for those travelling by car. Radya Pustaka Museum, Pasar Gede and Klewer Market are within a 20-minute walk away. Get very discounted price here. 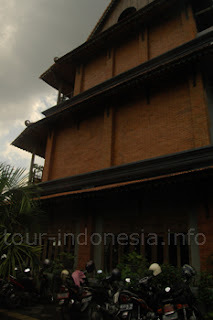 Regular price for Omah Sinten IDR 865.000/night. Our price start from: IDR. 705.000/night. BOOK NOW!